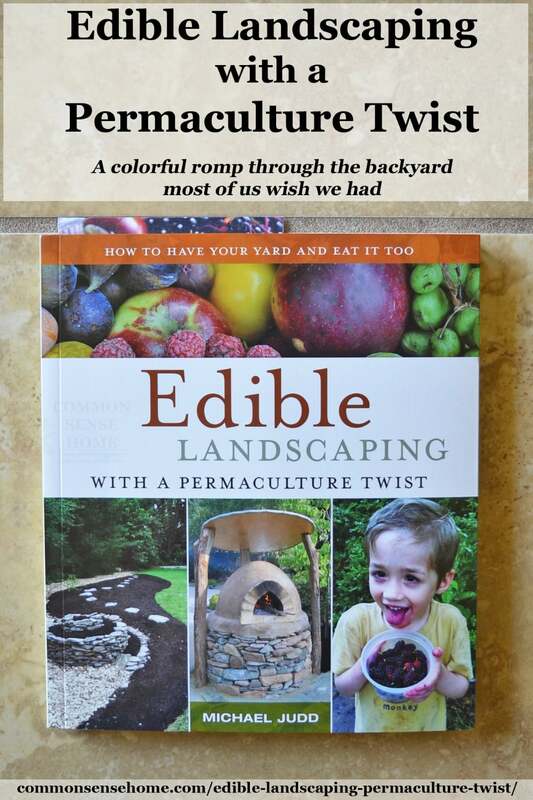 “Edible Landscaping with a Permaculture Twist – How to Have Your Yard and Eat it Too” is a colorful romp through the backyard most of us wish we had. 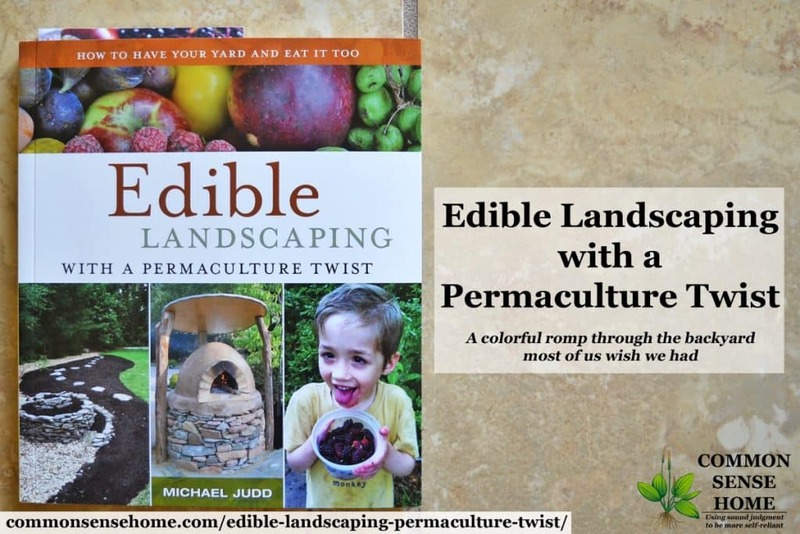 Featuring herb spirals, food forests, raised bed gardens, earthen ovens, mushrooms and more, Michael Judd's love of growing and creating shines though, inspiring the reader to look at their yard in a whole new way. Michael also has a healthy sense of humor, which my long time readers know is something I heartily embrace. Introduction – An overview of permaculture principles, and why you should transform your yard into an edible oasis. Herb Spiral, The Ultimate Raised Bed – Herb spirals are not just an attractive focal point – they also offer a range of micro-climates in a small space. The spiral form can be used for more than just herbs, too. Elevation is often beneficial to heat loving crops such as tomatoes and peppers. Rainwater Harvesting, Swales & Rain Gardens – If every yard in America captured and cleaned more of its rainfall on site, we could make strong steps toward recharging our water tables. The water features covered in this chapter are not only functional, but beautiful as well. Fungi! Growing Specialty Mushrooms – Mushrooms are so much more than those little grey buttons at the grocery store. They are a fundamental part of a healthy ecosystem, as well as a low input food source that can potentially produce for years. Food Forests – Why have a single tree in an island of lawn when you can create a micro-forest? With the correct choice of trees, shrubs and groundcover, you can create maximum productivity in a minimum amount of space. Uncommon Fruits – “Chosen for ease of care, beauty and taste”, you won't find these fruits in most grocery stores, but hopefully you'll soon find them in more backyards. We've added several of them, including pawpaws, to our homestead permaculture plantings. Hugelkultur, Mounds of Fertility – These heaps of wood covered in soil create the perfect incubator for fungi and the foundation for a variety of plantings. The trap and hold water to create self-hydrating raised beds. Earthen Ovens – These are the “cool kid on the block” project – functional, but with an obvious aesthetic appeal. I thoroughly enjoy permaculture, and Michael is a great storyteller. The photos are bright and eye-catching, such as this introduction to the Unusual Fruits section. Projects are highlighted with illustrations that provide an overview of the process, then broken down into step by step directions (with photos) that are easy to understand. Here's an example from the beginning of the earthen oven section. Throughout the text, common mistakes are pointed out, which is certainly a boon to those of us who would prefer to avoid them. Near the end of the book, Michael discusses his inclusion of alcoholic beverages in the book – noting that he isn't a lush. His experience has been similar to my own – when a fruit harvest comes in, it can come in hard and fast, and you can only eat so many containers of jam and so much fresh and preserved fruit. Turning excess fruit is a great way to use marginal fruit (with bumps and bruises) before it spoils, turning it into a product that will last a very long time. Even if you don't drink much, most of us have someone in our lives who would appreciate a bottle of homemade wine – or you may be able to barter it for other goods or services. This isn't an in depth, uber detailed permaculture guide. For that, I'd recommend Gaia's Garden or Permaculture: A Design Manual. It's also not a farm scale or farm market type book (for those needs, check out The Resilient Farm and Homestead or Restoration Agriculture). This one's meant for the casual backyard grower who wants fruit at their fingertips. 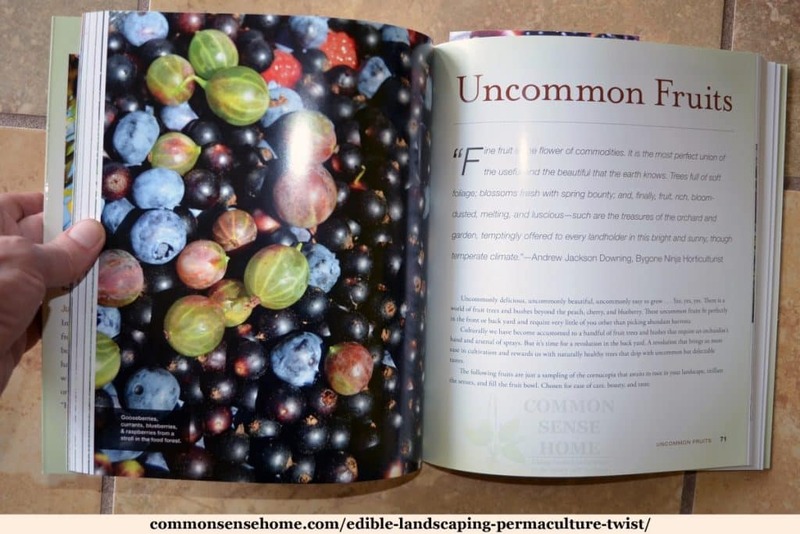 Edible Landscaping with a Permaculture Twist is fun – plain and simple. 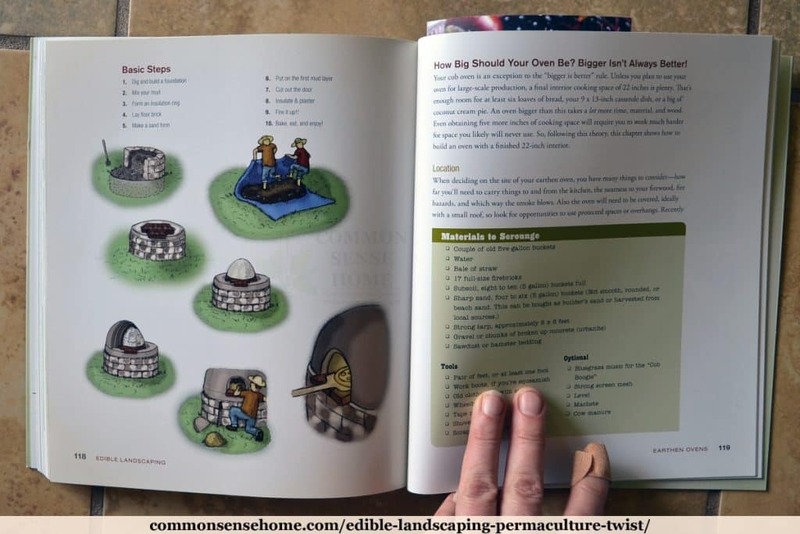 Painted with broad strokes and big ideas for small spaces, this book is meant to help you start thinking beyond the ho-hum yard of boring grass and trees with mulch volcanoes to a diverse, healthy landscape filled with different colors tastes and textures. I enjoyed it, and I think you will, too. Note: I did receive a copy of the book for review. As always, my opinions are my own. This would be a nice addition to my gardening library!! So strange – i’ve been hearing so much about pawpaw fruit trees lately, including the other blog post y’all had about it. I’m beginning to wonder if they would thrive in S. Texas where I am and run my landscaping biz with my brother. I’ve researched and saw that that do well in Florida, East Texas and everywhere in between. The heat there may be a little too much, but it might be worth an experiment.